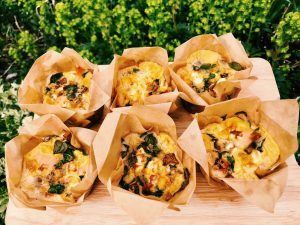 With the Spring sunshine fast approaching, we have created some perfect Easter picnic treats for you to pack up and take along to the park with your friends. You can enjoy these recipes hot or cold and they are easily transportable. 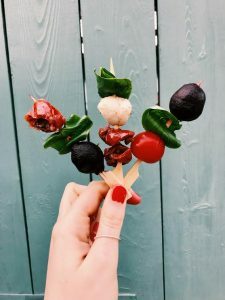 Fun and easy to prepare, they are suitable to make with children*, so give them a go with your friends and family! 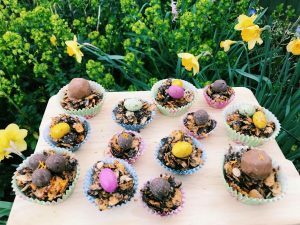 * Easter Nests were tried and tested on a 9 year old; he was very keen to help…but only because there was chocolate involved! You can add whichever superfoods you wish; another great option would be a teaspoon of maca powder. Hemp seeds and flaxseeds are loaded with fibre, protein and omega 3, and are very subtle in taste so you can enjoy a sweet treat whilst also getting some nutritional benefits! Combine the cornflakes, almonds, flaxseeds and hemp seeds in a large mixing bowl and stir together. Break the chocolate into a heatproof bowl and add the honey. Add a little boiling water to a saucepan and heat until simmering. Place the bowl over the simmering water (but don’t allow the base of the bowl to touch the water). Heat until the chocolate has melted. Add the melted chocolate to the mixing bowl and stir all the ingredients together. Divide the mixture into cases and decorate with toppings of your choice. Refrigerate for at least 30 minutes, or leave overnight for the mixture to set. If the chocolate is not runny enough, add a tiny bit of milk to the pan, to smooth it out. Whisk the eggs in a medium size bowl. Add the spinach, cherry tomatoes, dill, quinoa, mushrooms, spring onion and garlic. Stir well. Crumble ½ (15g) the feta into the bowl. Distribute the mixture evenly between the muffin cups. Chop the smoked salmon into small pieces and divide it evenly between the cups. Mix in gently with a knife. 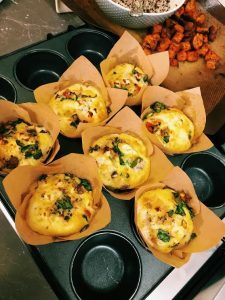 Crumble the remaining feta (15g) on top of each of the muffin cups. Bake for 20 minutes, or until golden brown on top. Enjoy whilst hot, or store in the fridge and heat for 2 minutes before eating, or enjoy cold! 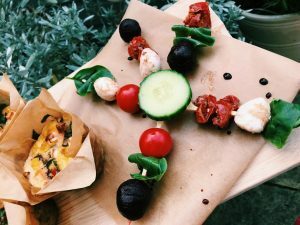 You could also include some protein on these skewers, such as smoked salmon or prosciutto. For a vegan option, use beetroot, basil and cherry tomatoes. Gently slide your chosen ingredients on to each cocktail stick; get creative with the combinations! Garnish with a drizzle of balsamic vinegar and enjoy!